If there were any legitimate objections in this list of 194 alleged contradictions that DJ Black Adam pointed me to then they were lost in their overly literal and transparently false interpretations. You don’t even need any Bible knowledge to debunk most of them. The skeptics just misread the text or read it out of context. I also think that their dictionary doesn’t contain the word paradox, though most of the items on this list don’t even approach that level of sophistication. I pray that they would take the text seriously and accept its life changing message. Every one is aware that there are contradictions in the Bible, except for the fundamentalist idiots. So mere differences aren’t contradictions. To be a contradiction something has to be the opposite. Just for grins, I grabbed a few of the 194 “contradictions” to see how robust they were. #4. The angel told Joseph. Mt.1:20. The angel told Mary. Lk.1:28. So the angel went to Joseph and to Mary. That is simply not a contradiction. Why they would include something like this is beyond me. #11. Satan tempted Jesus. Mt.4:1-10; Mk.1:13; Lk.4:1,2. Satan had no interest in Jesus. Jn.14:30. The plain reading of the text shows that Satan has no hold on Jesus. It does not claim that he has no interest in Jesus. Why do they think that is a contradiction? #27 The people were not impressed with the feeding of the multitude. Mk.6:52. The people were very impressed with the feeding of the multitude. Jn.6:14. Mark 6:52 for they had not understood about the loaves; their hearts were hardened. At first glance the skeptics appear to have a point. After all, Mark 6:52 seems to indicate that they didn’t have a strong reaction. But did you notice that the first word of the verse isn’t capitalized? I wonder what the previous verse says and why it wasn’t included . . .
Mark 6:51-52 Then he climbed into the boat with them, and the wind died down. They were completely amazed, for they had not understood about the loaves; their hearts were hardened. Ah! Maybe the skeptics left it out because it annihilates their “contradiction.” It turns out the people were impressed after all. You just have to go back one half sentence, or one word for that matter. So are these guys really that ignorant or are they truly deceptive? Do they just assume that people won’t open the book for themselves? I may come back for more later. The Tektonics Apologetics Encyclopedia is a good site to bookmark (it is in my Apologetics links to the right). You can quickly look up a passage to see thorough responses to common objections. Too bad our universities won’t show films like that. Re. “doing the irreparable” — That is one of the things the pro-legalized abortionists ignore. People change their minds sometimes, and woman often do so during their pregnancies when they are feeling very stressed or unsupported. But you can’t undo an abortion. Marshall also made a good point about Social Security. The scientific fact that abortion destroys an innocent human being is all the reasoning we need to demonstrate the immorality of the practice, but there are many other negative consequences as well, including the absence of tens of millions of people in our economy. From the “I am not making this up” department: Planned Parenthood offers gift certificates, just in time for Christmas. Long depression was FDR’s fault – Be skeptical and even nervous about all the “solutions” being bandied about today. Serbian abortionist becomes pro-lifer after 48,000 abortions – I hope our leaders who are pro-choice have the same dreams that this guy did. Ticket still available for the shows on December 5 -7. Go to HRB Tickets or buy them at the door. This is my annual Nutcracker post, which is one of those family pieces that not everyone will care about. You’ve been warned. 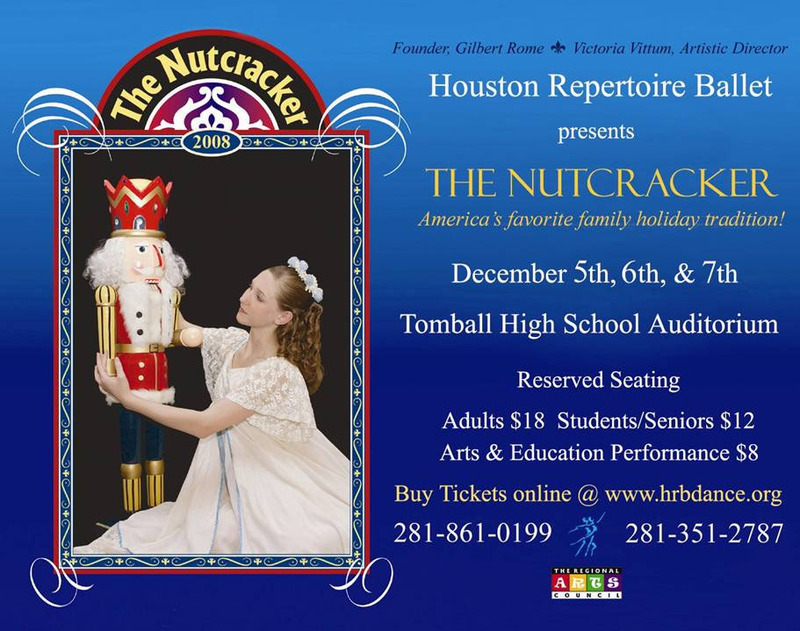 If you are in the NW Houston area and would like to get tickets to any of the shows (December 5-7), click here. It really is your best holiday entertainment value. No need to drive downtown and pay higher ticket prices for the Houston Ballet. They used a picture of Daughter 2 in the poster again this year. I love Nutcracker weekend. The kids work so hard and finally get to perform five shows over three days and spend lots of time with their friends. A few professionals are brought in, including two from New York’s American Ballet Theatre. This will be my fourth year to be part of the production. It is sort of a glorified crowd scene role (one of the guys joked that we are just there as eye candy – ha!). There are six families in the opening party scene, so they need some dads to be involved. The role is referred to as “Party Dad,” but not in the sense of, “Woo-hoo! Hey hey! Party Dad!” We basically mingle, pretend to talk, and do some limited old-timey dancing (not ballet). The girls each have a bunch o’ roles. Daughter #1 is the Snow Queen, Dewdrop Fairy and others. It is her last year so she will have lots of stage time in the lead roles. Daughter #2 is the lead Arabian, Harlequin Doll and in the cast of several group numbers. They’ve been in the shows nearly 10 years, starting with roles as mice, so it is fun to see them dance more and more every year. Greetings! The back-and-forth with Job and his not-so-supportive friends continues. Job seems to drift off course here. His is correct in rebuking his friends, but not in saying that God has wronged him. May we all be quick to credit God for all good things and the countless blessings we have and to remember that for those who love him He will take the bad things in life and use them for good (Romans 8:28). That is ironic, considering that we are still discussing his words thousands of years later! What a great verse in the midst of his lament! Yes, Jesus lives and He stood on the earth and will stand on it again. That is such an interesting thing for Job to say, especially considering that this may be the oldest book in the Bible. May all Christians remind ourselves that our redeemer lives and that in the end He will stand upon the earth. Job seems to know that there is more than just this earthly life. We are eternal beings. Again, Job’s friends speak some truths and some overly broad generalizations. Yes, true and lasting joy will only be yours if you are tied in to the author of all joy. Job correctly notes that sometimes the wicked prosper in this life. They have been mocking God and his existence for thousands of years. that he is delivered from the day of wrath? and a countless throng goes before him. Job is angry at his friends for jumping to conclusions that his sin caused his misery. Sometimes being silent with someone who is suffering is the best thing. Bildad is drawing a false conclusion about evil men. Yes, God will punish them eventually for all their sins. Some may have more consequences in this life than others. But it isn’t an immediate correction. Bildad and Job’s other friends kept assuming that Job’s sin was the root cause of his torment. Job didn’t quite understand the cause, so he questioned God. Sometimes we get answers in this life and sometimes we don’t.